Global Voices Advocacy is pleased to announce the second of several planned manuals focused on the topics of circumventing internet filtering, anonymous blogging and effective use of Internet-based tools in campaigns for social and political change. Blog for a Cause! : The Global Voices Guide of Blog Advocacy explains how activists can use blogs as part of campaigns against injustice around the world. Blogging can help activists in several ways. It is a quick and inexpensive way to create a presence on the Internet, to disseminate information about a cause, and to organize actions to lobby decision-makers. The goal of Blog for a Cause! : is twofold: to inform and to inspire. The guide is designed to be accessible and practical, giving activists a number of easy-to-follow tips on how to use a blog to further their particular cause. In addition to the information provided above, the guide is also full of examples of advocacy blogs from around the world, to inspire readers with a glimpse of what is possible. These featured advocacy blogs have a variety of goals, ranging from freeing a jailed blogger in Saudi Arabia to protecting the environment in Hong Kong and opposing the conflict in Darfur. The guide was written by Mary Joyce, a student of digital activism based in Boston, and was commissioned by Global Voices Advocacy, an anti-censorship project of Global Voices online. If you found this guide useful when setting up your blog campaign, please email us to let us know. Download Blog for a Cause! : in English and help us translating the guide in your language. 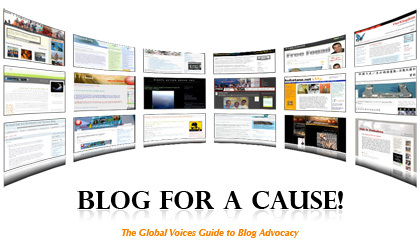 Pingback: Global Voices Online » Guide: Bloguer pour une cause ! Pingback: Global Voices në Shqip » Udhëzues: Bloguer pour une cause!